"If all the world's a stage, I want to operate the trap door." This time out, I have random notes on this and that in lieu of my usual opening commentary. We begin. * On Friday, May 9, NBC's Dateline broadcast "The Comic Book Murder," a two-hour examination of the 1990 murder of comics store owner Barbara George and the conviction of Michael George, her husband, for that murder. Though the crime itself and that it took nearly two decades to bring the killer to justice are shocking enough, Dateline sadly chose to further sensationalize and simultaneously trivialize Barbara George's death by accessorizing its program with garish comics imagery and lettering and by its constant nickname-y identification of her killer as "the comic-book man." In doing so, the program cheapened its otherwise laudable coverage of the story. * Since I'm sending you surfing around the Internet, I should also direct you to Mark Tyler Nobleman's spiffy Noblemania. Nobleman's the author of the soon-to-be-published Boys of Steel: The Creators of Superman, the first picture book biography of Jerry Siegel and Joe Shuster. His blog tells the stories behind his books and gives peaks at the information he's gathering for new books he plans to write. Recently, for example, he's uncovered a treasure trove of information about Bill Finger, the co-creator of Batman. I'm talking never-before-seen photographs of Finger and conversations with Charles Sinclair, Finger's long-time writing partner, who gave Nobleman a paperweight that belonged to Finger. How cool is that? I am talking to a few other convention promoters as well, but, for now, these are the only events on my schedule. * I was reading a years-old issue of Bill Black's America's Greatest Comics and found a wonderfully wacky "Mr. Scarlet and Pinky" story. Its intro caption reads: "Brian Butler, struggling lawyer, and his young ward Pinky are secretly known as Mr. Scarlet and Pinky, dynamic foes of crime." Several thoughts crossed my mind. A super-hero who is also a struggling lawyer is kind of a neat idea. Marvel could have done that with Matt Murdock, but, once he and Foggy Nelson started getting high-profile heroes and villains for clients, that ship sailed. How does a struggling single lawyer get a young ward? I mean, sure, millionaire Bruce Wayne seems like a pretty good bet to raise a kid. But a struggling lawyer? Mr. Scarlet and Pinky? Those are super-hero names? How does "secretly" translate to Pinky having the same name in both his civilian and costumed identities? In the story itself, Butler is invited to a seance at a rich woman's home to see if he "can prevent a robbery." That strikes me as more of a job for a security guard than a lawyer, but he takes the gig so he and Pinky can get a good dinner. Played right, that could have been very funny. Can you see why this struggling lawyer notion appeals to me? Clearly, I was born to write Mr. Scarlet and Pinky. IDW Publishing sent me a five-pack of first issues and I found merit in every one of them. 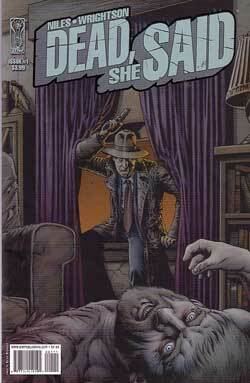 Dead, She Said #1 [$3.99] teams Steve Niles with artist Bernie Wrightson for a story wherein a newly-dead detective tries to find the who and why that led to his murder. Those mean streets don't get much meaner that this. Niles does a terrific job blending street-grit, a flashback to a fleeting moment of woodsy happiness, and the hint that something evil and unworldly is on the prowl. Wrightson utilizes a down-to-earth style that works well with this material. My only quibble is that colorist Grant Goleash gets a little too muddy-dark with his hues in some scenes. Dead, She Said has my attention. 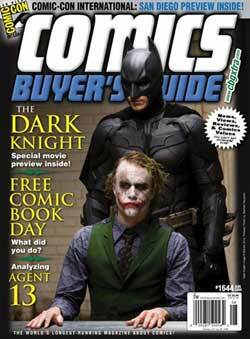 This issue earns four out of five Tonys. Igor Movie Prequel #1 [$3.99] has two stories starring a mad scientist's lowly assistant who longs to himself become a mad scientist. Written by Dara Naraghi and drawn by Grant Bond, these tales are great fun and only a bit on the dark side. The animated film, scheduled for fall release, stars the voices of John Cusack, Steve Buscemi, Jennifer Coolidge, Eddie Izzard, and other comedic talents. Igor Movie Prequel #1 makes me want to see the movie and that earns it four Tonys. Star Trek: Assignment Earth #1 [$3.99] is a wonderful concept for a Trek spinoff, the further adventures of characters introduced in a "back door pilot" during the show's original three-year run. Gary Seven is an extraterrestrial agent whose mission is to save the people of Earth from themselves. He's assisted by the brilliant-but-flighty Roberta Lincoln, his Beta Five computer, and his more-than-an-ordinary-cat. Sadly, given all one can do in the comics format, this debut issue comes off as rather pedestrian. 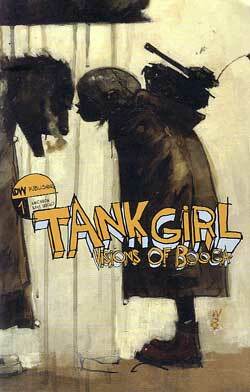 Writer/artist John Byrne tells a solid story, but it reads like an adaptation of a bland 1960s TV show. There's just nothing in it to excite the imagination as did the original Star Trek. Nor was the art up to Byrne's usual level; several characters looked stunted. I'm hopeful that subsequent issues will be better. For now, all I can give this first issue is a disappointing two Tonys. Tank Girl: Visions of Booga #1 [$3.99] by writer Alan Martin and artist Rufus Dayglo is fun, but comes up a bit shy of delivering a satisfying story. Just as this flashback adventure of the comically criminal duo starts to get interesting, there's a "to be continued" and a back-up story. There are some decent laughs in the back-up story, but I would rather have more pages of the lead. If you like adventure and humor comics with a more alternative than traditional slant, you'll like Tank Girl: Visions of Booga #1. From me, it earns a respectable three Tonys. The cheese is strong in Zombies! 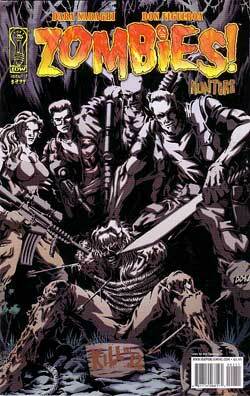 Hunters #1 [$3.99] by writer Dara Naraghi and artist Don Figueroa. Mostly unpleasant rich folks hunting zombies for sport is a premise that would be a natural for a Sci-Fi Channel original movie. Fortunately for IDW, this reader likes his monster cheese. Naraghi and Figueroa earn a respectable three out of five Tonys. IDW is publishing a lot of cool comics of late. I recommend you check them out. Edited by Bob McLeod, Rough Stuff [TwoMorrows; $6.95] cover-proclaims its mission statement as "celebrating the ART of creating comics!" Issue #8 [Spring, 2008] lives up to that mission and then some, presenting dozens of terrific drawings by featured artists Nick Cardy, Tony DeZuniga, Alex Horley, and Rafael Kayanan. But there's so much more to the magazine. Belgian comic art collector Dominique Leonard gives American readers an accessible introduction to some of the great artists of Belgium and France. Len Gould interviews cover artist Mike Mayhew about his art, accomplishments, and goals. Kayanan, Mayhew, and Horley share their "pre-pro" art; one of Horley's drawings was done when he was eight. Though the magazine is geared towards artists and their fans, editor McLeod slips in helpful information and tips that will also serve writers well. I particularly enjoyed his "Rough Critique," wherein he examines an aspiring penciller's sample page and offers sage advice. Rough Stuff #8 is well worth its cover price. It earns four out of five Tonys. Viz Media sent me a box of its new manga series and I enjoyed the three I've read so far. My favorite is Gimmick! [$9.99] by Youzaburou Kanari (story) and Kuroko Yabuguchi (art). Brash young Kohei Nagase is a master of makeup and special effects. His works are flawless and he can create them at unbelievable speed. His Studio Gimmick team can do any job film makers ask of them, but the heart of the series lies in their off-screen adventures: helping a young starlet escape from her vile manager, foiling the schemes of a murderous makeup artist to bring real terror to a monster theme park, assisting a scarred artist in getting back into the biz, and becoming unwitting pawns of conscienceless criminals. This first volume ends on one heck of a cliffhanger, ensuring I'll be back for the second volume. Gimmick! earns the full five Tonys. 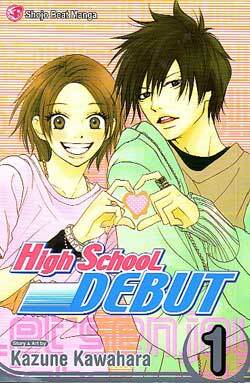 High School Debut [$8.99] is a lighthearted romantic comedy. Feisty lovelorn Haruna Nagashima only cared about two things: softball and manga. But, on entering high school, she vows to find love. Her problem: she doesn't have a clue how to get a boyfriend. Her solution: convince a handsome sullen upperclassman to teach her how to make herself appealing to boys. Creator Kazune Kawahara isn't breaking new ground, but she's filled this manga with generally likeable characters, relatively realistic teen angst, and amusing situations. It's a pleasant way to pass a few hours and that earns it three Tonys. Teen monsters in love is just part of the appeal of Rosario + Vampire [$7.99] by Akihisa Ikeda. Its hero is Tsukune, an average student who can't get into a high school and ends up going to the distant Yokai Academy. On his first day, he learns he's the only human being in a school set up to train monsters - vampires, werewolves, etc. - how to blend in and exist with the human race. Tsukune receives a love nibble from a pretty vampire with a split personality, runs afoul of a vicious upperclassman, almost gets devoured by the swim club, and attracts the attention of a gorgeous succubus. Indeed, between the vampire and the succubus, Tsukune is the Archie Andrews of Yokai Academy. 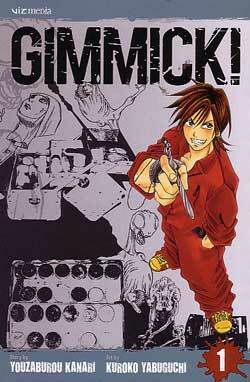 The manga is very funny, but doesn't shy from more dramatic and emotional sequences. Between this new manga and Gimmick!, Viz is on a roll. Rosario + Vampire earns the full five Tonys. The fledgling Aazurn Publishing has set itself an intriguing goal. When you buy one of its comics, Aazurn owner and publisher Gary Scott Beatty wants to make certain you read a complete story. All their titles are done-in-one stories and its initial offerings are both written by Beatty. 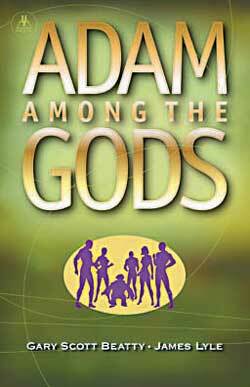 Adam Among the Gods [$3.99] is a science-fiction tale set in a perfect future. In a world of god-like immortals, the freakish Adam is revered as the father of these "new humans," the first genetically-altered human to survive past infancy. But there are extremist groups who loathe the genetic tampering forced upon them before birth and who long for the return of individualism to their world. They challenge the new status quo, even as events move beyond the control of either side of the question. Beatty's thoughtful story is as tight as you would expect from a done-in-one comic, but the coincidental timing of its key events screams of convenience. The telling of the tale seems more forced than natural. On the visual end of things, artist James Lyle delivers solid storytelling and drawing. Beatty handles design, lettering, and coloring. It's not a flashy comic book, but it has a clean, clear, individual look to it that I appreciate. Adam Among the Gods earns three Tonys. Suggested for mature readers, Seductions [$3.99] offers a twist on the vampire. Its protagonist sleeps for ten years after each feeding, forever mourning his lost love, forever seeking some new love to ease his anger at that loss and end the loneliness to which his eternal existence has condemned him. Shot from artist Bill Bryan's compelling pencils and enhanced by Beatty's colors, Seductions draws the reader into the vampire's hunt for "life" and love. One feels his pain even as one loathes his manipulative manner. Complete unto itself, this comic book is another satisfying done-in-one presentation. When I first read/reviewed Josh Howard's Dead@17, its echoes of Buffy the Vampire Slayer weighed somewhat heavily on me. Those echoes have faded into barely registering background noise with his Dead@17 Compendium Edition [Viper Comics; $24.95], a 340-page tome collecting the original Dead@17 trilogy and dozens of pages of related art. Dead@17 is the story of murdered teenager Nara, who rises from the dead with incredible power and purpose, part of God's plan to prevent a secret evil from conquering the world. Her friends are drawn into the fray alongside mysterious men and women from both sides. 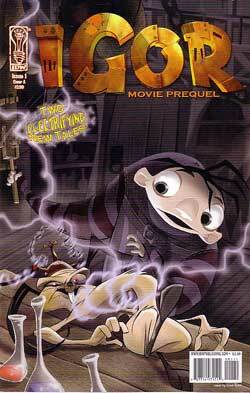 Things becomes increasingly deadly when a second teen is resurrected by the forces of darkness. It's a big, meaty story which writer/artist Howard presents it with sharp visuals, dialogue, excitement, and heart. The heart especially is powerful, centering on the unbreakable friendship of Nara and Hazy. I see my daughter Kelly and her closest friends in these characters. The book's bonus material is spectacular. There are galleries of covers, posters and promotional materials, pin-ups, and even fan contributions. This Dead@17 Compendium Edition delivers great bang for your bucks. Buy it for yourself and for your friends who enjoy the afore-mentioned Buffy, and recommend it to your local library. It earns the full five out of five Tonys.